Update. I have since been informed that this recipe is actually for an apple cake and not an apple pie. My excuses for this mistake, blame it on my non-native-englishness. I am confident to say though that as an apple cake this is equally delicious and easy. Try it, and let me know how it turned out! It is Monday morning. A busy day ahead awaits us . Lots of things on the schedule, many things to do, and all waiting for us to do it. But let’s take a moment first. Let’s pour us a cup, and have ourselves a little treat. Today I am sharing this easy apple pie recipe. It is so fast, quick and easy and it always comes out so well. I learned to bake this when I was a kid. It is from my mom’s old baking book from the fifties. It has never failed me and I make it when I need a little extra sweetness in my life. And when I have apples. I will admit that I’ve had a piece of this for breakfast at more than one occasion. But hè, it has fruit in it, so it must be good. And it is Monday morning….. This cake is soft and moist and sweet and indulging and so very forgiving. ……….because we are worth it…..
Now this is not particularly good for all the floppy parts and dangling bits on our bodies. But it is good for the soul. And if we have a small piece in the morning, I am sure we can get away with having another piece for afternoon tea too. This baby freezes well. We can save the rest for another Monday morning when we need a little pick me up. Just pop it in the microwave straight from the freezer and it will taste like fresh. Let’s start baking shall we. Pour the dough in a baking tin (13 inches). Level it with a wet spoon. Pit and peel the apples. Quarter them or cut them in eights depending on size. Carve in the round side. Put them on the dough in circles. Bake for 30 minutes at 175 C (347 F), until golden brown and a toothpick comes out clean. After baking spread hot jelly over warm cake. Let cool. Sprinkle with icing sugar. You can replace the apples for any fruit actually, this basic cake recipe works with just about anything. Let your imagination go wild! Hope you enjoyed having a piece of apple pie with me. Bedankt voor het recept. Lijkt me heerlijk. Dat is hij echt! Uit het oude Dr. Oetker bakboek dus mislukt nooit. Ik heb ook een exemplaar van het boekje, ik zal eens kijken of hij er in staat. Thank you, Marianne, for the easy apple pie recipe. I will be trying it today. Have a great week! I hope you do! And I hope you like it as much as we do! Ohhh this looks like it’s from a bakery in Santa Barbara or at The Stanford a Center near San Francisco. Looks beautiful!! Oh, a bakery in Santa Barbara, now that sounds like a place where I would love to go for a piece of apple cake! Would you join me there? Wouldn’t it be fun if we could just do that, have a piece of cake and a cup of tea together?! Maybe one day. 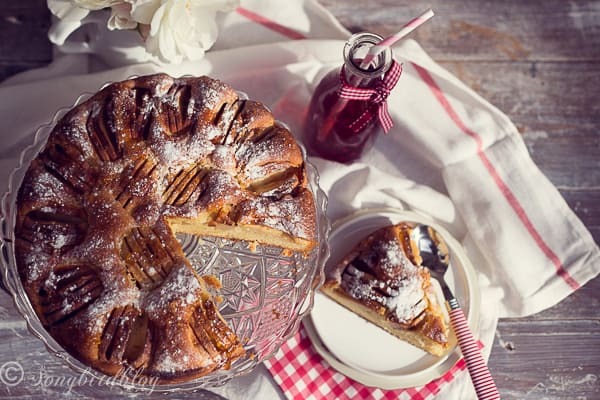 Is this an apple pie or an apple CAKE? You are saying pie in one sentence and cake in the next. It certainly looks like a one layer cake…(and it looks delicious! )…I’m confused…. Sorry about the confustion! Marilyn informed me that this is in fact an apple cake. I can tell you it is a very nice apple cake though, even if it is not a pie. English is a foreign language for me, so I get confused sometimes. Hope that doesn’t stop you from trying this recipe, though. Dear Marianne, I think technically this is an apple cake. It looks wonderful! I will definitely take it somewhere so that I have to share it, but I’m glad to hear it freezes well, too. Thank you so much for converting the recipe for us Americans! Hi, Marilyn, Thanks for letting me know that my pie is in fact a cake. Well anyway, it is easy and very good and I hope you’ll try it. Sorry for the confusion. guess my non-native englishness shines through sometimes.